My alarms go off at 5:15a and 6:05a in the morning* and I’m usually woken up by the middle of an international story on NPR or if I hit the snooze button, The Writer’s Almanac. These usually cause me to hit the snooze button again or rearrange the pillows as makeshift earmuffs until something more interesting comes on. I was pleasantly surprised this Tuesday morning to hear the words “David Sedaris”** and immediately perked up while not touching anything on the clock. I’ll admit that my clock is too fancy for me, I only know how to snooze or turn the alarm off. If I’d touched anything else, I might have missed the story. 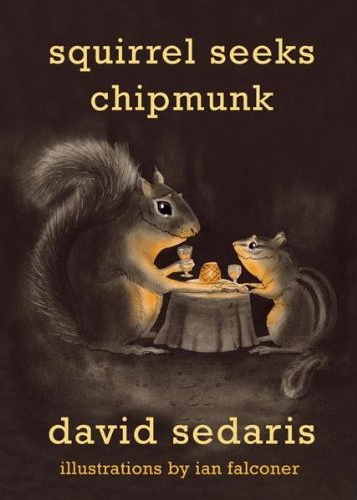 *deep breath* There’s a new David Sedaris book out! If you’ve seen him live or picked up Live For Your Listening Pleasure , you may have heard one or two stories from the new collection Squirrel Seeks Chipmunk: A Modest Bestiary . Listening to the NPR interview, I like how he’s used animals–without names–to tell his tales while giving them all-too-human attributes. I sort of wish I’d thought of something like that when I started this blog. Well, there was something liberating about writing a story about a squirrel and a chipmunk, because I didn’t have to worry about the chipmunk coming to me, saying — you know, thanks a lot. Thanks a lot for telling the world about me and that squirrel. The NPR site has audio and transcript of the segment and audio of Sedaris reading “The Mouse and The Snake” and now that Amazon has expanded Kindle to web browsers, you can read the first chapter for free! I haven’t picked it up yet, but I have added it to my wish list… y’know, if you were wondering what to get me on the last day of my birthday month. Happy Friday eve and if you’re in the DC area, stay dry! ** And surprised that I’d been listening to NPR regularly and hadn’t heard them for a while. *** Something true, mind you. My life is crazy enough without me having to make stuff up. Previous story trends: shirtless pitch men? Gonna hear him read Monday night. Can’t wait! He’s so great in person!